Hello! This is my space to show you my academic experience, my skill portfolio and some other information about myself. I am Ernesto Marcelo Mislej [vCard]. I am 29 30 years old and I live in Buenos Aires, Argentina. 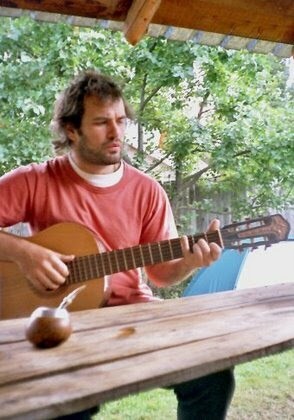 Me in El Bolsón, Argentina (February 2003). I have recently got a MS in Computer Science from the University of Buenos Aires (UBA). For my MS thesis I have designed Cocovas: an Information Visualization system for Internet IR systems which uses a novel Visual Metaphor unifying in a single view the representation of the similarity and the relevance of document results. You can learn more about this project in the Cocovas's Page. I am working as TA in a Machine Learning course (2005-present) in a Master of Data Mining & Knowledge Discovery (UBA). I have also worked as TA in an Information Visualization course (2003-2005, present) and in a Data Mining course (2000-2002) in the CS Department of University of Buenos Aires (UBA). My research experience and interests are focus on Business Intelligence and Knowledge Data Discovery (KDD). In the last years my research aim to investigate Information Visualization, Machine Learning, Web Information Retrieval, Data Mining and Human Computer Interaction (HCI). Since the last year I have joined a student's group about Collaborative Filtering (CF) with my brother and other friends. We participate in the Netflix Prize contest. Presently I am starting to found my own company; meanwhile I am working as a part-time consultant. In the past, I have worked as IT & Software Advisor at AFIP, the Argentinian Bureau of Internal Revenue (2002-2007). I have worked evaluating and recommending software products and giving technology and architectural advisory for several projects. Some of them you can find in the Résumé section. I have worked as a researcher in Information Visualization at CoreST in the "DARPA’s Cybersecurity Visualization Workshop" (2002). Information Visualization, Machine Learning, Web Information Retrieval, Data Mining, GIS. Web Design, Usability, Human Computer Interaction, User Centered Design. Python, Java, Perl, C/C++, VB.Net, C#, Scripting langs. W3C Standards: XML, (X)HTML, XSLT, (FO)XSL, CSS, SVG. I was certified as Red Hat Certified Engineer (April 2006). You can paste my CN 804006028920120 into the Red Hat Certificate Verification Service to verify my certificate. Spanish (native speaker), English (fluent reader and writer, good speaker). My academic activity in BI & KDD proccess, from foundation algorithmics to the presentation stage, gives me the knowledge to develop high quality KDD and Information Visualization solutions. Continuous research in new technologies and market trends are my strengths. They allow me to design effective and strategic solutions for different kind of business necessities. You can contact me to offer a challenging technical position as Information Visualization designer or for my consultant services. I am able to travel for a short-mid period of time. You can download my detail résumé [pdf - 6k] and the XMLResume source [xml - 14k]. You can also see it in a visual timeline(not ready yet). Please do not hesitate to contact me if you need any further information. Like a rollin' stone. I consider myself an artistic eager guy and I hope it never ends. As you see in the photo, I play the guitar and I play other regional stringed instruments too like the charango from Bolivia and the cavaquinho from Brazil. I really enjoy to learn music history and to stay tuned about new trends. I also have taken acting and playwright class. In the last years I have been made some drawings and paintings. I hope to increase my gallery soon. I am planning to make an InfoVis Blog with my infovis design ideas, trends and news. Meanwhile you can visit: InfoVis.net, the InfoVis:Wiki, EagerEyes.org, Information Aesthetics, VisualComplexity and Hipertextos.